Blumind doesn't pack much in the way of bells and whistles, but it does come with multiple color schemes (you can also individually set the color used for every element). Blumind is good for more than mind maps, too: You can use it to create org charts, logic charts, and tree diagrams. You don't have to decide in advance which format works best with your data; even after you've added nodes to your mind map, you can easily turn it into an org chart with a single click. Much like with the MindMeister web-based mind-mapping tool, you can expand or collapse nodes, and you can create lines connecting different nodes (even if they're not siblings of the same parent). You can also add an icon for each node, from a range of built-in icons such as smiley faces, stars, and other clear and readable symbols. You can also grace any node with a progress bar, if you like to use your mind map as a project management system. One key feature MindMeister has over Blumind is versioning. Blumind contains an Undo function, but it is far less powerful than MindMeister's visual timeline. The Blumind user interface is sparse, consisting mainly of a single toolbar at the top of the window and a property grid docked on the right. You can use the grid to change a node's color, icon, progress bar, shape, and more. It is a powerful control and makes for a consistent user interface, but it doesn't make it easy to tell which properties are more important than others, and you may end up scanning the list over and over for whatever it is you're trying to change. Blumind is easy to get started with, and since it is free, portable, and tiny, it provides a gentle introduction to the art (and science) of mind mapping. 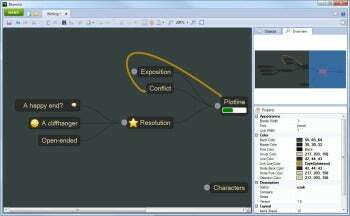 And if you ever feel a need to graduate to a more comprehensive system, Blumind can export your creations using the Freemind mind-mapping format, which you can then import into MindMeister and other mind-mapping applications. Blumind is a free, tiny, portable tool for quickly creating mind maps, org charts, and logic diagrams.